Read an interview with Julia Fabényi, director of Ludwig Museum – Museum of Contemporary Art in Budapest. Tina Kaplár: You have already been the head of Kunsthalle Budapest and the Directorate of Baranya County Museums. The latter coincided with the city of Pécs being the Cultural Capital of Europe in 2010 and the opening of the Zsolnay quarter. You obviously have some good insight on the Hungarian art institutional system – what is your assessment? Julia Fabényi: Hungarian cultural and art institutions are currently undergoing some major changes, the final results of which are not yet visible. One thing is certain: The lack of resources, the decrease in state and private funds due to the economic crisis is not beneficial for stability or long-term planning, however, it does force us to be more efficient. What is important for us is that the Ludwig Museum, as part of a large, international network and as a special, contemporary art institute should be a significant factor in the eyes of the public as well as the professional audience. TK: You have been leading Ludwig Museum for almost a year now. How do you evaluate this period? JF: I am happy with the past three quarters. We managed to offer a strong, internationally relevant, yet colourful and accessible line-up. “Allen Ginsberg and the Beat Generation”, Fabrizio Plessi’s “Liquid Labyrinth”, the Russian-Croatian “Transition and Transition”, the Judit Reigl exhibition, the recently opened Simon Hantai retrospective exhibitions, and the Éva Köves-Andrea Sztojánovics multimedia exhibition work on different levels, they all satisfy different visual and cultural expectations. We also published the catalogs of three past exhibitions (Antal Lakner’s “Workstation”, the “Cage behind the Iron Curtain”, and “The hero, the heroine and the author”) as well as catalogs for “Transition and Transition” and the Plessi exhibition. Currently we are working on two major catalogs, which will be published shortly. We have achieved all this on a very low budget, focusing on efficiency. TK: In your proposal you wrote that prestigious and high-quality venues for contemporary art already exist in Hungary and that Ludwig should focus its attention on the international scene with the purpose of integrating Hungarian art into it; it should drive the development of Eastern European contemporary art, which, geopolitically speaking, is a lot more than merely the art of post-Soviet states. How do you plan to translate these ideas into action? JF: In “Transitions and Transitions” a critical approach to post-communist social setup was markedly detectable in the works of Russian and Croatian artists, as well as the question itself: whether the period of transition has come to an end. We endeavor to exhibit works by Eastern European artists who reflect upon this period throughout the year. Examples are “The silence of battlefields”, “Revolutions”, and Ernő Tolvaly’s monographic exhibitions. They all address the era of the change of regime and what came after from the point of view of art history. TK: Among your short-term goals you mentioned the expansion of the target audience by developing communication methods, the creation of points of contact with contemporary art institutes nationwide when it comes to event planning, and strengthening the role of the Friends’ Circle. What steps have been taken to reach these goals? JF: Statistics allow us to analyze the changing number of visitors in multiple ways. It is clearly visible that our special guided tours – where non-museum workers and even non-art professionals talk about the works, offering a different point of view – and other one-off events increase the number of visitors. These new approaches are just as important as visitor number increases because if we consider that art is for everyone, then it should be open for interpretation by everyone as well rather than just a narrow group of specialists. Based on this we expect that today’s one-off visitors will become regulars, and in the future they will turn into fans of contemporary art. For many of our exhibitions we cooperate with others – Hungarian universities, artists, authors, institutions – this means consulting, authoring, renting artworks or even whole exhibitions. We have some strong lecturers, who often come from elsewhere in the country, but their research shows a whole different approach. This is why it is important for them to have a platform in Budapest. As for managing the “Friends of Ludwig Museum”, the circle of our supporters, we have got some very agile art lovers on board, who have a special talent for network building. The number of our members has increased radically, but we have not stopped recruiting and we have more and more interesting events to offer to them. This is a key milestone for the museum since the expectations of friends’ circles indicate how the wider audience’s needs are changing. We need to offer them an intellectual “dry” wellness in order to really make their visits a refreshing experience. TK: Among your long-term goals you named the professional preparation of the new museum complex, which is to be constructed in the new Museum Quarter of Budapest. How is this going? JF: The announcement was made in October, before that we had been analyzing the situation and defining our expectations. The way the spaces are created can conceptually change the life of a museum. We try to create spaces with new functions in the name of sustainability, spaces that generate revenue but also are important, integral elements of a modern museum. I would like to underline that it is – and it is going to remain – a museum rather than an exhibition space or a multi-art center. From what we can see abroad, contemporary art museums will have an important role in the development and fulfillment of the cultural demands of future generations – as museums. It is also evident that an institute that demands the interest of an audience cannot allow itself to close for a minute, we need to establish a professional concept on multiple levels. We tried to express this in the architectural program. The call for proposals is ongoing; we will have a winner by September. TK: Do you go to contemporary art markets, and how do you see their role in the art scene? JF: I rarely go to markets, if I get to one or two in a year I am happy. For me it is still the big exhibitions that are important. That is where I see a bigger scope of theoretical movements as well as the emergence of new trends. At the same time art markets do have a key role as they ensure an educated circle of collectors, and galleries and also collectors can check the validity of their own concepts there. Economy, that is to say markets, is an inevitable factor in the art scene; at art markets art and economy go hand-in-hand, and this makes art markets an indispensable element of the art world. TK: How do you see the roles of commercial galleries in the art scene, and how could you potentially cooperate with them? JF: They are key elements in the art scene now, even in Hungary. The artists of younger generations all belong to galleries. This is a very good trend since management is a profession most artists do not lean toward by nature. It is becoming increasingly frequent that public collections rely on the offerings of galleries. Buying directly from the artist is getting rare. The difference in price is marginal, and galleries get the professional praise this way. It is also important that they provide alternative venues alongside the bigger institutions, thus taking a serious role in not only fulfilling but in shaping the demands of an audience hungry for contemporary art. TK: In a general sense, where do you place the Hungarian art scene in the bigger – Central-Eastern European – picture? JF: The global economy crisis was palpable in the art world as well. In reverse proportions: the bigger the crisis, the more exciting art venues come to life. The small institutes that act as dynamic art forums and that were formerly called alternative venues are, in my view, Eastern Europe-specific phenomena. Art today is not only an exhibition: An artistic project is the raising and the thematic investigation of an issue. This is fine, this is interesting. This maintains the possibility of free movement, which is very important in art. We could call this the antipole of the institutionalization of art. TK: How do you see the region’s position and future prospects in an international context? JF: Within a year or two, according to my original plans, we will develop several traveling exhibitions, which will travel within the Ludwig network. This is still under progress, I will be able to tell you more later. Julia Fabényi (dr. phil, art historian) worked as director of Gallery of Szombathely (1996-2000), Kunsthalle Budapest (2000-2005), director general of Directorate of Baranya County Museums (2007-2012) and director of Janus Pannonius Museum, Pécs (2012-2013). 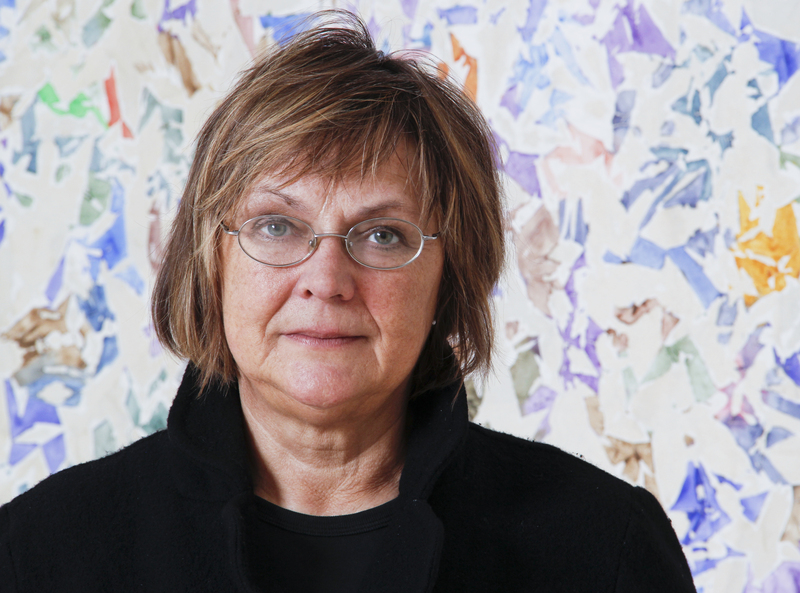 From June 2013 she is director of Ludwig Museum – Museum Of Contemporary Art, Budapest. As a curator she organised more than 85 contemporary art exhibitions during her career. Tags: Allen Ginsberg, Andrea Sztojánovics, Éva Köves, Éva Köves-Andrea Sztojánovics, contemporary art, Contemporary Art Museum in Budapest, Ernő Tolvaly, Fabrizio Plessi, Judit Reigl, Julia Fabényii, Ludwig Museum Budapest, Museum Quarter Budapest, Simon Hantai. Bookmark the permalink. Thank you for sharing the news. I love Budapest to be honest !